The largest and most affordable Online Cargo Bike Shop! Cargo Bike shop the largest and most affordable! Do you want to buy a Cargo Bike online? Hollandbikeshop.com has the Cargo Bikes you’re looking for. A Cargo Bike is basically a transport bicycle that has either two or twee wheels, and a large box in the front, to put your things (cargo) in. It's also a great way to safely transport your child(ren) in. Up until the fifties the Cargo Bike was mostly for professional use. These days it's also a perfect mode of transportation for young families, thanks to the many innovative adaptations that have been made to the bike's design. The Cargo Bike is often used in urban traffic as an efficient replacement of the car. Cargo Bikes with three wheels are particularly popular: they're stable and light, even when the bicycle is loaded with cargo. At Hollandbikeshop.com you can find a wide choice of Cargo Bicycles by brands like Gazelle and PFAU-Tec. In our wide Cargo Bike range on Hollandbikeshop.com you can find the practical Cargo Bicycle in various colors, sizes and models. These Cargo Bikes are available with two wheels or three wheels and either have a solid box or frame to place a fabric tub in. Additionally, Cargo Bikes are equipped with gears and a conveniently low entry. So you’ll surely find the Cargo Bike you’re looking for. 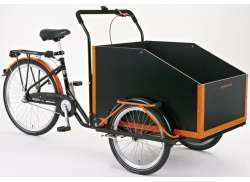 Hollandbikeshop.com is dealer of Cargo Bikes and has a large and affordable range. We also often have Cargo Bikes on sale or in our outlet, so keep an eye on our sale button. The largest and most affordable online Cargo Bike shop!